A fiery dish with sliced beef and beansprouts. 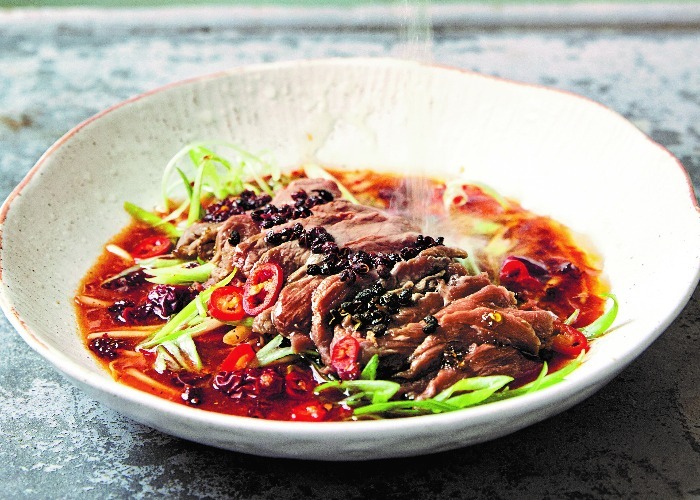 If you are afraid of heat, you can tone down the use of Sichuan peppercorns, but they do impart a delicious numbing heat that is highly addictive. Season the beef with salt and ground white pepper and dust with the cornflour. Whisk together all the ingredients for the sauce in a jug, then set aside. Heat a wok over a high heat until smoking and add the rapeseed oil. Add the garlic, ginger, red chilli and dried chillies and stir-fry for a few seconds to release their flavours. Add the beansprouts and toss for 5 seconds, then season with the Shaohsing rice wine or dry sherry and the chilli oil. Pour in the sauce and toss to combine well, then bring to the boil and transfer to a heatproof serving dish. Wipe out the wok, then place back on the heat, add the vegetable oil and heat to 180°C (356°F) using a thermometer or until a piece of bread dropped in turns golden brown in 15 seconds. Take off the heat. Place the spring onions and raw beef slices in the serving dish on top of the beansprouts and sprinkle the Sichuan peppercorns over. Taking care, pour the sizzling hot oil over the top to cook the beef and fry the peppercorns and spring onions. Serve immediately.